A few mixes and boxes come together for this stupendous trifle layering red velvet cake. Heavenly pudding, berries and whipped topping making it the perfect dessert. This recipe is from Holly Clegg’s trim&TERRIFIC® Eating Well to Fight Arthritis cookbook. Enjoy more delicious Holly Clegg recipes at hollyclegg.com. Preheat oven 350°F. Coat two 9-inch round cake pans with nonstick cooking spray. In mixing bowl, combine cake mix, oil, eggs, and water, blending until well mixed. Pour batter into prepared pans and bake 20 minutes or until toothpick inserted comes out clean. Meanwhile, in bowl mix together cream cheese and a little milk to blend. Add remaining milk and both boxes of pudding, mixing following directions on box. 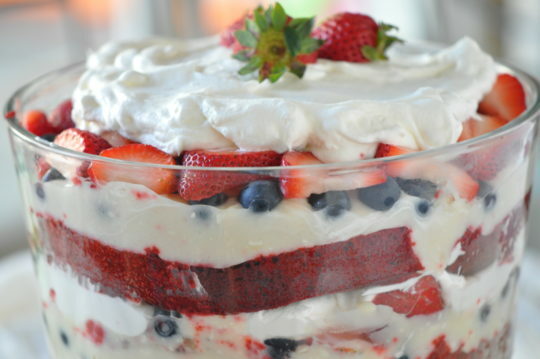 In trifle bowl or large glass bowl, layer cake, 2 tablespoons orange juice, half the pudding, berries, and whipped topping. Repeat layers ending with whipped topping.